Monty Luke was hired August 1, 1936, by the Utah Highway Patrol. 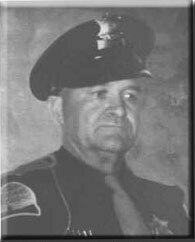 On December 3, 1959, Trooper Luke’s patrol vehicle was found by a truck driver, partially submerged in the cold waters of the Sevier River about six miles south of Circleville, Utah. His body was found in the river about 50 feet from his vehicle. Investigators determined that Trooper Luke was traveling northbound on U.S. Highway 89 at a high rate of speed, perhaps in pursuit of a violator, when he swerved to miss several deer crossing the roadway. After leaving the roadway, his patrol vehicle sheared off two large posts, rolled down an embankment and landed in the river. Trooper Luke was thrown from the vehicle. He died at the scene at the age of 55. Trooper Luke was survived by his wife, Wilma, a daughter and four sons.